Hey there, everyone! I know....two blog posts in one day?! That's unheard of for me!! I wanted to sneak this one in, because I created a card for a couple of challenges that end today...and wanted to make sure I got them linked up. So- after going out and getting some shopping done (I got a SUPER cute pair of new skinny jeans, black boots, and some fabulous tops! The tops, by the way, were all 50% off. Gotta love snagging a good deal! ), I came home and created the card below. 1. Make A2 card from brown cardstock, then round the bottom corners. 2. Cut chevron paper slightly smaller, then round the bottom corners. 3. Punch holes in the side of a dotted paper strip, then adhere to the left side of the chevron paper block. 4. Wrap tape & lace trim around the left side, then adhere the entire block to the card front. 5. Stamp the thank you sentiment in the lower right corner, then add the floral vines to the front. 6. Stamp the other sentiment to a banner cut paper strip, then adhere a wooden button to it. 7. Adhere the sentiment banner to the front, then add a heart jewel over top of the thumbs up icon to finish. Well, that is everything I have for you this evening! Don't forget, that this is my second post of the day. So, either CLICK HERE to see the previous post, or scroll down. My Bible study notes are in the post below, so if you have been keeping up with that...then be sure to check that post out. I hope that you have an awesome evening! Wow, this is absolutely gorgeous, Lea! Trendy and elegant, no doubt! I love how you've combined the lace trim, Smash tape, and punched border along the side. Thanks for joining us this week at CASE Study! This is adorable! 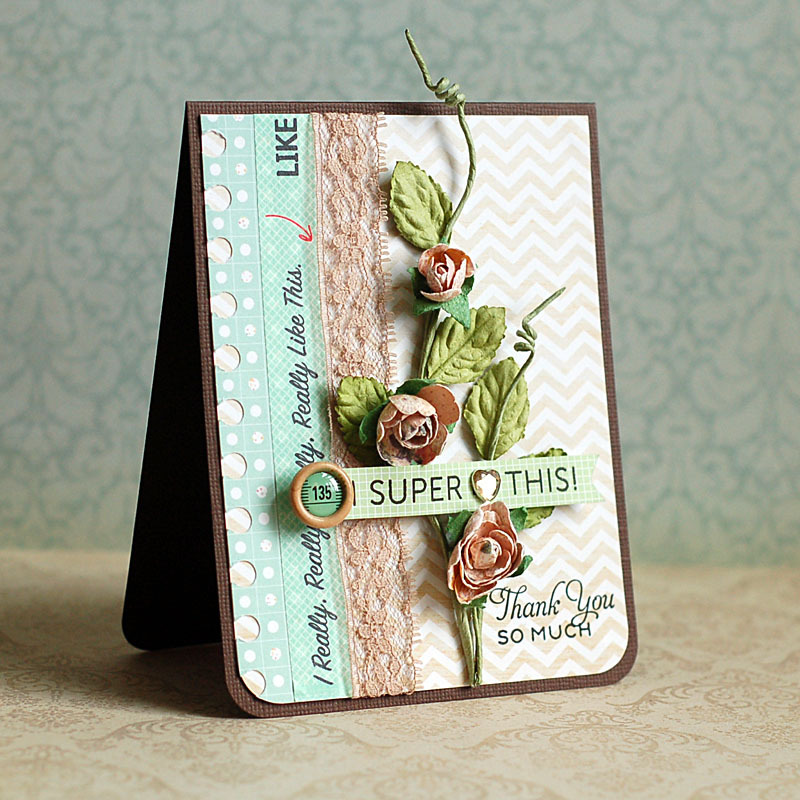 Love the focal point with the roses and vine from Prima! I super heart this card! Beautiful card lovely design ... Many thanks for playing at CCCB! super gorgeous card! Thanks for playing with us at The Play Date Cafe! Beautiful card! Love the lace and flowers! Thanks for playing at The Play Date Cafe. This is so pretty, thanks for playing along with us at CCCB! You really know how to combine challenges with zing, Lea! I immediately recognized the CASE Study layout, and love your spin on that. Thank you SO much for leaving love at my blog recently. It's a pleasure to have you visit! Congrats on winning on the PDCC- it is a stunning beauty! Super this for sure! Congrats on the recognition ! Your card looks amazing. Thanks so much for playing along with us over at CCCB! Love your use of washi tape on this card, and I love this set too! Beautiful card. This is one of the most beautiful cards I have ever seen!